Delivering outstanding economy, your Amana brand APH15M Packaged Heat Pump is built using a high-efficiency scroll compressor. Thanks to its high-quality compressor, this unit cools efficiently, quietly and dependably for longer life compared to lower SEER units with a reciprocating compressor,Our coil design provides maximum efficiency in minimum space. Aluminum fins are bonded to enhanced copper tubing for more efficient heat transfer. All coils are leak-checked electronically and pressure-tested during the manufacturing process to assure reliability.The GPC15M is Energy Star qualified, runs quietly, and is environmentally friendly. This unit is durable, and it is covered by a 10-year parts warranty. The GPC15M is suitable for installation on a rooftop or at ground level.Longevity. This unit is housed in a steel cabinet coated with scratch-proof paint. It also includes a weather-resistant outdoor coil, a compressor relief valve, and a durable blower motor.Versatility. The GPC15M is capable of horizontal flow or downflow. An auxiliary heat kit is also available.Quiet Operation. The blower on this model is fully-insulated to reduce noise.Efficient. The GPC15M has a 15 SEER rating and is Energy Star qualified.Environmentally-Friendly. This model uses R-410 environmentally-friendly refrigerant The GPC14H offers superior heating and cooling performance in a self-contained unit. This packaged air conditioner is suitable for both rooftop and ground level installations. It is also energy-efficient and environmentally friendly.Durability. This unit comes with a heavy-gauge steel cabinet with a UV-resistant, scratch-free finish.Environmentally-Friendly. The GPC14H uses environmentally-friendly R-410A refrigerant.Quality. 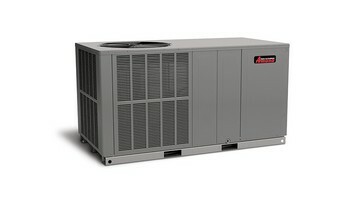 This model includes a lubricated and enclosed fan motor, an EEM blower motor, and louvered coil protection.Versatility. This unit is approved for use on modular and manufactured homes. It’s also compatible with electric heat kits.Warranties and Accolades. The GPC14H is ETL listed and AHRI certified. It also includes a 10-year limited warranty on all parts.The GPC13M is an energy-efficient, cost-effective model that offers quiet operation and superior performance. All functional parts on this unit are covered under a limited 10-year warranty, and the GPC13M uses only energy-efficient R-410A coolant.Easy Maintenance. The GPC13M allows for easy access to the insulated blower compartment.Versatility. This model is capable of downflow or horizontal airflow. An optional electric heat kit is also available.Sturdy Construction. The GPC13M is housed in a galvanized Steel cabinet that is coated with scratch-resistant powder paint. The unit’s permanently-lubricated fan motor is completely enclosed for safety.Warranties and Certifications. This model includes a 10-year limited warranty on all functional parts. It is also ETL listed and AHRI certified.One of Amana’s least expensive packaged air conditioners, the GPC13H offers quality performance at a low price.Durability. This model’s condenser coil is louvered for protection, and its cabinet is made from durable galvanized steel.Environmentally-Friendly. The GPC13H uses chlorine-free, environmentally friendly R-410A coolant.